A bank reconciliation is used to check bank transactions in Brightpearl against the real bank statement. This ensures every deposit or withdrawal in the bank account is also processed in Brightpearl and that the values match exactly. The reconciliation process allows you to input the date and balance details of the bank statement. Brightpearl will then list all the transactions within the statement period. The process is then literally a case of checking that each and every item on the bank statement exists in Brightpearl with the exact same amount. As each item is identified it is checked off in the Brightpearl reconciliation process and the amounts are added up as you go. Once all the statement items have been confirmed and checked off in Brightpearl, the final balance should be equal to the closing balance of the bank statement. Once the balances are equal the statement can be closed in Brightpearl. This locks those accounting entries so that they are not edited after the reconciliation has been performed and confirmed they are accurate. Doing this for every bank statement will ensure that your bank balances are correctly accounted for and reported. By doing this for every bank statement you will identify any discrepancies or posting errors in your accounting system early. This makes identifying the reason for discrepancies much easier to find, rather than trying to do it at the end of the year. Go to Accounting > Reconcile and select the bank account to reconcile. Click the Add a new statement button. Enter the statement reference, start and end dates. Note that the period of each statement cannot overlap. Enter the end balance. The start balance is automatically taken from your last reconciliation. If this is your first reconciliation enter the start balance from the statement too. The statement is listed. Click Open to begin the reconciliation. Find each item appearing on the real bank statement and ensure the amounts are correct. If the amounts match select the checkbox against the item and continue checking. If the amounts don't match right-click on the journal ID for the item and "open in a new tab". Make the necessary corrections to the values so that they match what cleared the bank account. Return to the bank reconciliation and save to refresh the screen. Now that the transaction matches, select the checkbox for the item and continue. If the transaction isn't listed in Brightpearl try searching the general ledger to ensure it has been entered. If it hasn't been entered ensure that the transaction is processed then return to the bank reconciliation and save to refresh the screen. You can now select the checkbox for the item and continue. If the transaction exists but isn't listed it may be in a dated outside of the reconciliation - by default only transactions within the statement date range and any unreconciled items 30 days prior are listed. Use the Include earlier unreconciled checkbox to widen the search. When all the bank statement items have been found, matched and selected, the end balance for the reconciliation should match the statement end balance, and the difference is zero. When this happens the Close statement button becomes available. To finalize and complete the reconciliation click Close statement. Once closed the reconciliation can't be changed and the accounting entries are locked to edit. A foreign currency bank account is reconciled in the same way as a base currency bank account since each bank account and the transactions processed through the account are held in the foreign currency. Take the opening and closing balances on the statement and convert them into your base currency using a monthly average exchange rate. 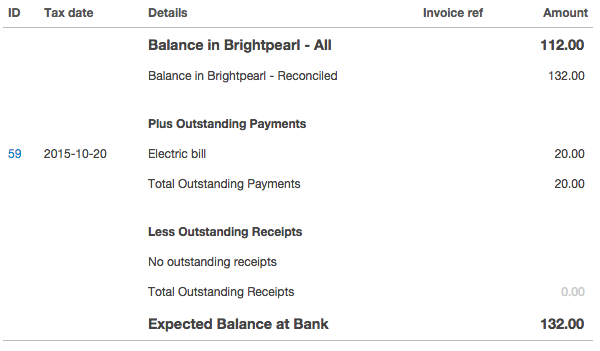 In Brightpearl, go to Accounting > Reconcile > Bank account. 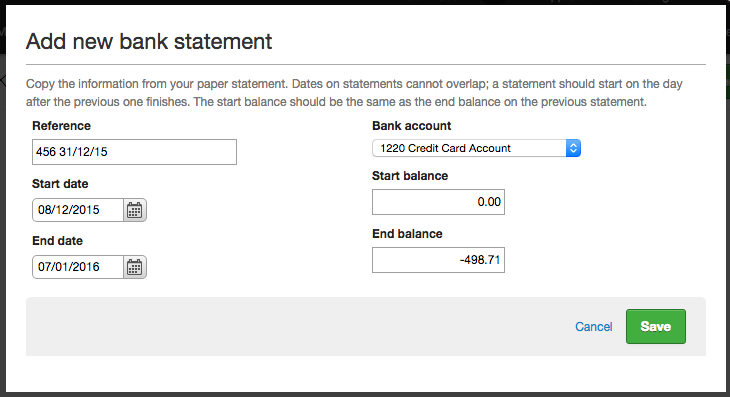 Enter the start and end dates of the statement and enter the converted opening and closing balances from the statement. Once the statement is added click Open to begin the reconciliation. Look at the first item on your physical bank statement and find the matching transaction in Brightpearl. Mark the checkbox next to the item in Brightpearl. Continue doing this for every single item on your bank statement. Read more below about how to handle missing transactions. When you have marked off every item on your paper statement with a transaction in Brightpearl you will end up with an out of balance reconciliation. Make a note of this difference and whether it is a positive or negative figure. Save the reconciliation. To make it balance you will need to post an adjustment journal to account for exchange rate gains & losses. Select the closing date of the bank statement. 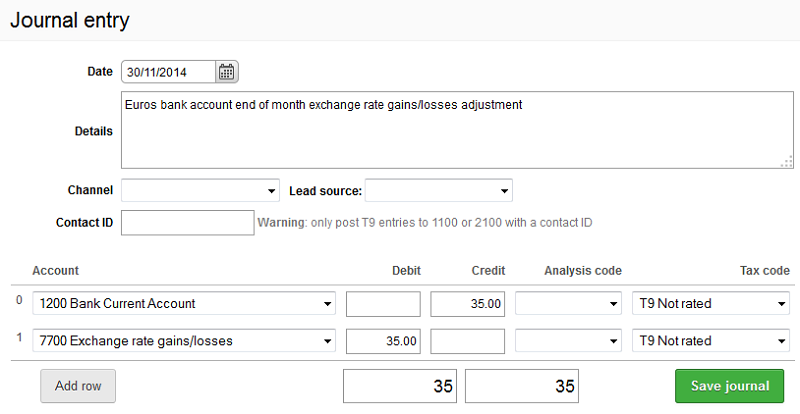 Select the bank account nominal code on the first row, and the exchange rate gains/losses nominal code on the second row. Against the bank account, enter the difference recorded on the reconciliation. If the reconciliation difference was positive enter it as a debit, if the reconciliation difference was negative enter it as a credit (as in the example). For the exchange rate gains & losses code, enter the same value as the opposite to the bank account debit/credit. Remember debits must always equal credits in a journal. Don't worry if you get the debits and credit the wrong way round, you'll know in a minute and can come back and change it. Save the journal to post it to accounts. Return to the bank reconciliation process and locate the entry you just made. Select the entry and this should make the reconciliation balance. If it makes the difference larger then you may have got the debits and credits the wrong way round in the adjusting journal. You can change them over by editing the journal. Find it at Reports > General ledger. Use the Close statement button to complete the process. If an item is on your statement but not in Brightpearl it means it's cleared your account so must be processed through Brightpearl. Use the monthly average exchange rate to convert it into your base currency so you can post bank charges and interest. Where the item is a payment from a customer it is easier to assume the amount of the invoice is what they've paid, so simply mark it as paid in full, any exchange rate variance will be picked up in the overall accounting adjustment. When you begin a reconciliation you enter the start and end dates. These are used to simply narrow down the list of transactions you've posted to the bank account nominal code; you want to check off all the items on your statement, but you don't want to have to scroll through a list of every single item that was posted over all time. You are not attempting to check off all the items posted in the period of the statement, only the ones that have cleared your bank account. Any left over will get reconciled on a future statement when they have cleared your account. The aim is to check off all the items that are on your bank statement. You should check them off on the paper statement as you check them off in Brightpearl reconciliation. A credit card reconciliation is carried out in the same way as reconciling a bank account. The only difference with a credit card is that it is debt, so when beginning the reconciliation the statement balances should be entered as negative values. If an item on the bank statement is not found in Brightpearl it will need to be entered. An example might be a cash withdrawal by the business owner. This withdrawal needs to be processed as a bank payment to record the movement of money out of the bank and to the business owner. Once you have processed the transaction in Brightpearl you will be able to reconcile it. If an item on the bank statement is in Brightpearl but not found on the reconciliation screen then it could be because it is dated outside of the reconciliation period. Use the Include earlier unreconciled checkbox to include older transactions. By default the reconciliation shows all transactions in the statement period plus any unreconciled transactions in the 30 days prior. If an item on the bank statement has the incorrect value in Brightpearl the transaction will need to be edited to match. Clicking on the journal ID will take you straight to the journal to make corrections. Make sure you save your changes before leaving the reconciliation screen. If an item in Brightpearl is not on the bank statement it can be ignored for now. This indicates a transaction which has already been entered into Brightpearl but did not yet clear the bank account. It is likely to appear on your next bank statement and reconciliation. If the end balances don't match there is still a difference between what has been selected on the reconciliation in Brightpearl and what appears on the bank statement. Ensure all values match and all bank statement items have been found in Brightpearl. You may wish to investigate any very old unreconciled items. This could indicate that a transaction was processed through Brightpearl which never happened in the real world. Our partners at Evenstone have also written a handy blog post showing you what to look out for when your bank reconciliation won't reconcile. You can quickly see which bank accounts have unreconciled transactions on the bank accounts screen, they are highlighted with a red link, go to Accounting > List bank accounts. There's also a bank reconciliation report, which can be reached from a link on the bank accounts screen when a bank account has unreconciled transactions. The bank account activity report will also show which of the transactions are reconciled with a green check mark on the right hand side, you can filter the report to show just unreconciled transactions if you need to. The general ledger is also a useful way of viewing all accounting entries to a bank account, whether the transaction has been reconciled and when it was reconciled. Use the general ledger filters and then export the data to excel. The export provides additional information - reconciled yes/no, the statement ID and the date it was reconciled on. Bank transactions can be unreconciled. This might be in order to open up the accounting journal to be editable, or it might be because an item was reconciled by mistake. If the bank statement has already been closed it is not possible to unreconcile the single transaction - the statement must be cleared in full. This means that the full reconciliation will need to be completed again. If the bank statement has not yet been closed, the individual item can be unselected and the statement saved. Go to Accounting > Reconcile and select the relevant bank account. Locate the relevant bank statement. Click the Clear all link. The statement is reopened and all items that were previously reconciled within it are released. The journals are now available to be amended. The reconciliation will need to be redone. Why is my statement balance not the same as in Brightpearl? When you receive your bank statement it will list all the movements of money in and out of your bank account for the period, say a month. In Brightpearl you will have been processing transactions over the same period, but you have also started processing transactions for the next period - these transactions will be on a future bank statement. Why won't the bank account reconcile? A bank statement will only list the transactions that cleared within that period, but sometimes a payment can be processed in Brightpearl but not clear the bank account until the following period (sometimes the bank takes a few days to process the transaction) this means the transaction will appear on the next statement. When reconciling the bank account in Brightpearl this transaction will be left unreconciled until it does appear on a statement. Why are there unreconciled items on left over? Reconciliation cannot generally be done by simply selecting all items and expecting it to balance. The aim is not to check that all the transactions in Brightpearl are on the bank statement, but the other way around, that all the items on the real bank statement are in Brightpearl. There will always be extra transactions in Brightpearl - ones which have been processed but didn't clear the bank account and make it onto the current statement but which will appear on a future statement.